Spiritual maturity will result in some kind of ministry leadership. Mature Christians are sought out to lead. New and maturing believers seek those who will influence them to become more Christ-like. Building leaders is absolutely necessary for churches to become healthy and grow as God intends. Maturity results in making disciples. Strong churches stress ministry leadership where leaders breed leaders. 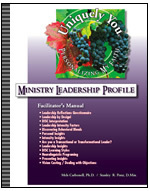 The Ministry Leadership Member's Guide features the Leadership Reflections 360 Feedback Questionnaire. Members can now assess their leadership ability in five vital areas: Calling, Contentment, Character, Crafting, and Coaching. These qualities are very important in the lives of every leader. Calling - Recognizing and obeying God's "call" to become leaders is the beginning step toward ministry leadership. Contentment - If calling connects us to God's plan for our lives and for our ministries, then contentment gives us the joy that can keep us in His calling. Character - What's inside of a leader is revealed through many events, circumstances, and actions that, over time, paint a self-portrait of a leader's character. Crafting - God has crafted us with unique talents, personalities, experiences, and gifts. "Great" leaders recognize the need to continuously seek to strengthen what God has given them. Coaching - A key role of every "exceptional" leader is to coach and raise up the leaders that God has placed in their care at home, in ministry, and in the community. The Leadership Reflections 360 Feedback Questionnaire assesses the leader in all five areas. Separate questionnaires can also be distributed to friends and associates to assess the individual's Ministry Leadership qualities. The results of the LR 360 Questionnaires can be averaged and a group dynamic graph created to help the individual improve his or her ministry leadership skills. Finding and / or building strong leaders will determine the strength and future of your ministry. Ministry Leadership will help you grow toward ultimately magnifying God.